How do we get our brand recognised? How do we become experts in our field? In order to grow to the next level, we have to put ourselves in a position to accelerate our performance. 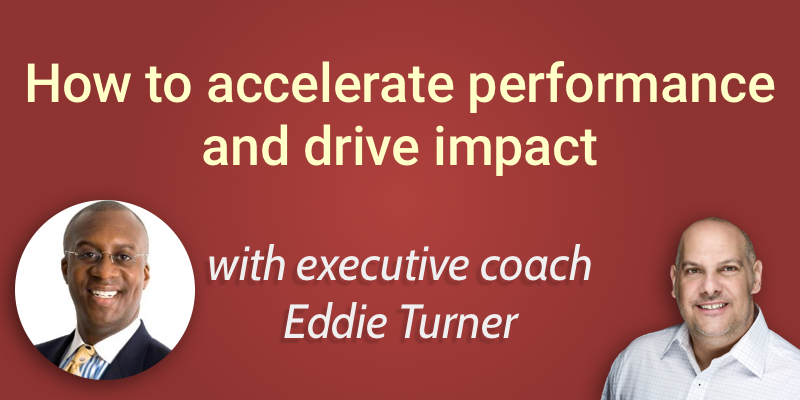 Today we speak with certified executive coach, Eddie Turner, who “works with leaders to accelerate performance and drive impact!” ™. What does it mean to accelerate performance and drive impact? How do you recognise complacency or stagnation in your career? What is the process to accelerating growth and moving to the next level? What are the mechanisms to driving impact? As leaders, one of the things we’ve got to do as we start to grow in our career and as we start to move forward is to think about the principles of how we can accelerate our performance and drive impact. At a point in our career, Eddie notes, we all recognise that we need to press the button to accelerate. Sometimes we’ve become stagnant, or at times we recognise that the pace of business is changing at lightning speed. As a result we need to be able to keep up. By putting mechanisms in place we can accelerate and increase our performance which results in impact in the business, our lives, and our careers. Before you can accelerate performance, you need to recognise if you are in a place of complacency or stagnation. There typically is an event that triggers this awareness. Eddie gives the example of having a piece of food stuck in his teeth. He doesn’t see it, so it takes someone else to point it out to him. He says this is often similar to our own flaws or foibles that are preventing us from getting to the next step in our career. Often, it takes someone else to recognise areas that are impeding progress. In other cases, individuals have a high level of EQ (emotional intelligence), and they realise on their own that something isn’t right and that they need help in progressing their development. In the case of needing outside help to recognise areas that need improvement, a mentor can be a great help. We discussed mentoring with Tom Goodlet on the show last week – so check that one out. What is the process of accelerating growth and moving to the next level? First, identify what areas you require help with and why. By undertaking a 360 review, you get input and feedback from your colleagues and employees reporting into you. This can provide a clear and honest picture of what needs work. From there you are able to move towards the next best version of yourself. Eddie draws on the example of the great Michael Jordan. The epitome of greatness, he had to recognise at a certain point that Father Time had caught up with him and he could no longer pull off the slam dunks he was known for. As he was ageing he had to add a new dimension to his game. By working with a coach that identified the issue, he developed the fade away that extended his professional career a lot longer. So at every point in an executive’s career, they need to make adjustments. In their case, Father Time could be the time in the business cycle, quarterly performance, challenges from competitors, etc. There are always going to be reasons that an executive has to make adjustments. A coach is uniquely positioned to help to do that. By working closely with a coach you can maintain your competitive edge throughout your career. What got you here, won’t get you there. In other words, you can’t rely on the same skillset as you climb the corporate ladder, move into different organisations or even different industries. You need to retool and develop a new skillset. Eddie also refers to the lessons of Professor Ronald Heifetz. Heifetz says that at each of these levels, we need to develop something called ‘adaptive leadership’. We need to develop new capacity to handle challenges. In too many cases, individuals are applying technical solutions to issues (pre-defined or prescribed actions to address an issue). Instead, you need to apply adaptive leadership, because these issues require a new skillset because you’re at a new frontier of competency. The International Coach Federation now uses the phrase ‘personal development coaching’ because individuals are interested in changing things in their career – but this often starts at home. These changes and approaches are relevant to your personal life as well as professional. What is my home life like? What is my personal life like? Interpersonal relationships with our loved ones often matter to our careers and professional lives. A mentor is someone who has been in a particular role longer that we have who can guide us and allow us to have a case study by watching them and learning from them in a particular role. A coach is an expert in the content, not the process. As a coach, you don’t have to have been the CEO of a Fortune 500 company to be able to coach that individual because they have skills in the process of professional development and getting the best from their clients. A trusted advisor is often a blend of the two. They sit in the step where they’re not just an expert, but they have the competence to give unfettered, candid, and specific advice that you can take and act on to give you direction. Part of Eddie’s work is as a facilitator. He does face-to-face strategy, process mapping, and issue resolution. Doing this work virtually allowed him to make a unique impact on several organisations. For example, for national or global businesses, gathering all the leaders for quarterly business reviews can be cost and/or time prohibitive. By meeting virtually, it allows organisations to stay connected for important strategy meetings from anywhere in the world. Similarly, performing one-to-one coaching sessions virtually can be highly beneficial. You can find Eddie through his website.